Of all the different types of cuisine, Italian food is my ultimate favourite. I could eat it every day and never tire of it. Pasta aglio olio, pasta al forno, pasta con sugo, lasagne, gnocchi,... you get the picture. One summer, I spent a month in Italy where I studied at the Università per Stranieri di Siena. It was there that I discovered incredibly delicious Italian dishes and found myself surrounded by people who shared a mutual love of pasta, prosciutto and profiteroli. I was in heaven! 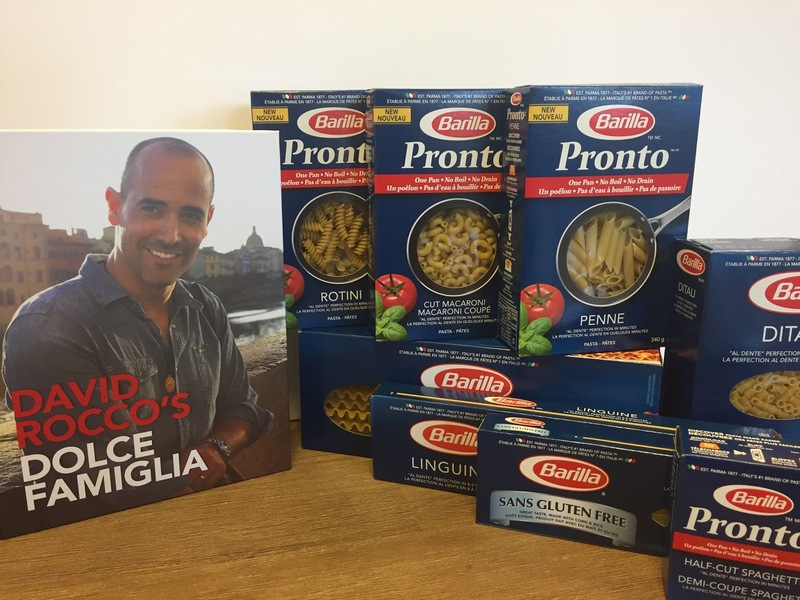 Celebrity chef David Rocco is the television host of David Rocco’s Dolce Vita, David Rocco’s Amalfi Getaway, and his newest program, David Rocco’s Dolce India. The author of two internationally bestselling cookbooks, and his newest, David Rocco’s Dolce Famiglia, David is seen in over 150 countries around the world–including in 80 million households each week in the US alone–on networks including National Geographic Channel International, Scripps Television’s Food Network and Cooking Channel, BBC Food, Discovery Travel + Living, Hola! TV, Chello, Fox Life and TLN. In addition to his own programs, David can also be seen on television’s Donut Showdown, Iron Chef America, and Top Chef Canada. His has recently ventured into wine-making with his own wine label, David Rocco’s Dolce Vita, featuring a prosecco, a Chianti and a pinot grigio. Barilla Pronto is an innovative, new pasta that helps make mealtime more convenient. Prepared in just one pan, there’s no waiting for the water to boil or fuss over draining excess water. Now, home cooks can save time on meal prep and clean-up without sacrificing the delicious taste and al dente texture they’ve come to expect from Barilla. Stay tuned for a special giveaway and hope to see you at the Fair! Disclosure: This is a sponsored post. Any opinions expressed in this post are my own. I wish that I lived closer to Toronto. I would love to attend the Royal Winter Fair someday. That Pronto product intrigues me .. would like to see if it truly doesn't taste starchy once cooked. Wish I lived close to it sounds like a very tasty event. Never tried their new Pronto pasta yet, looks interesting!